I ordered myself another Christmas present today. This can be risky as others are buying things for me, but I seriously doubt that anyone has their eye on this book with me in mind! 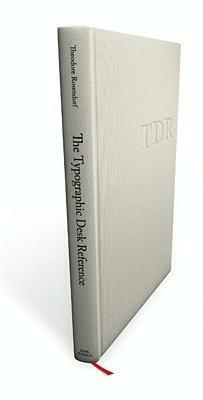 I stumbled across mention of The Typographic Desk Reference on some site or another, and as soon as I went to the site and looked at the sample pages, I knew that a copy would be making itself a home in my library. Ever since I worked at Corel, I’ve been a typography nerd and although I’ve been printing very little lately and the web isn’t really equipped for proper typography, I’ve remained a typography nerd. I’m hoping the web evolves to allow site designers to embrace more of the control enjoyed by those who print their text. There are rumblings that this will indeed happen and web typography will more forward. We’ll see. The proposals I’ve read about all have significant limitations, but I’m glad to see them anyway. Someone will eventually get it right. Worse than the music industry?